General Palmer served in the Spanish-American War, World War I and World War II. He died on 28 July 1958 and was buried in Section 30 of Arlington National Cemetery. His wife, Madeline Harding Palmer (18 November 1878-6 September 1958) is buried with him. His father, George Henry Palmer, Major, United States Army (Medal of Honor Recipient) is buried in Section 3 of Arlington National Cemetery. 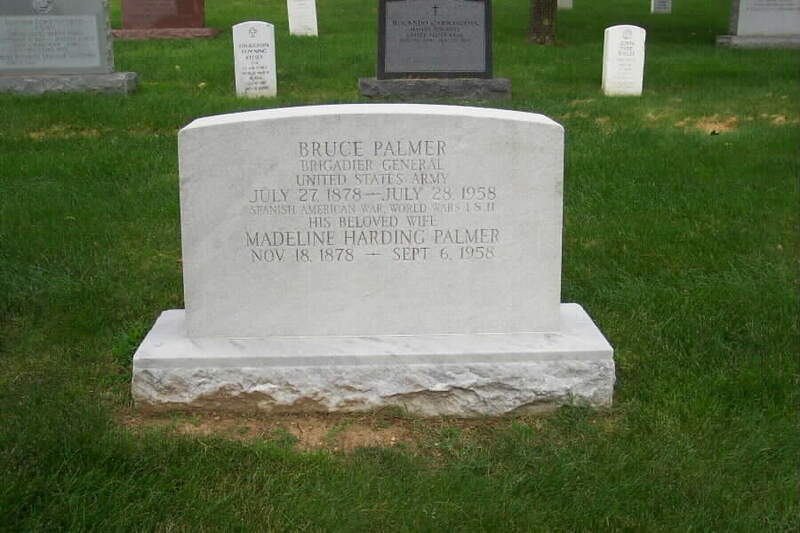 Buried nearby in Section 30 is his son, Bruce Palmer, Jr., General, United States Army. Thank you very much for your heartening website. Would you please consider adding to the web page of Brigadier General Bruce Palmer, Sr. that his son-in-law and daughter are buried near him - in addition to his son, General Bruce Palmer, Jr. His daughter is my mother, Marcella Palmer Blanchard, and her husband, Colonel Wendell Blanchard, (4th Armored Division Reserve Command at Bastogne) is my father; their graves are near those of her father, Bruce, Sr., and brother, Bruce Palmer, Jr., and their wives in Section 30.